Clarence Rupp was born on 16 April 1905 at Potosi, Grant, Wisconsin. He was the son of Anthony George Rupp Jr. and Mary Bertha Schaefer. Clarence Rupp was buried in 1925 at Mount Calvary Cemetery, Edgeley, LaMoure, North Dakota. [S364] Wisconsin State Census Wisconsin State Censuses, 1895 and 1905, by Ancestry.com, Dwelling 43. [S244] U.S. Federal Census 1910 U.S. Federal Census, by Ancestry.com, Year: 1910; Census Place: Wano, La Moure, North Dakota; Roll: T624_1143; Page: 2B; Enumeration District: 0118; Image: 66; FHL Number: 1375156. Joseph Kirkenbush married Charlotte (?). Joseph Kirkenbush was born circa 1805 at Prussia. [S246] U.S. Federal Census 1880 U.S. Federal Census, by Ancestry.com, EDNA Film Number T9-1427 Page Number 354C. Married Name Her married name was Kirkenbush. Charlotte (?) married Joseph Kirkenbush. Charlotte (?) was born circa 1834 at Prussia. Frank Kirkenbush was born circa 1859 at Wisconsin. He was the son of Joseph Kirkenbush and Charlotte (?). Joseph Kirkenbush was born circa 1863 at Wisconsin. Louis Kirkenbush was born circa 1868 at Wisconsin. Name Variation Anna Rebecca Mechler was also known as Annie. Name Variation Anna Rebecca Mechler was also known as Meshler. Married Name 2 October 1893 As of 2 October 1893,her married name was Pluemer. Anna Rebecca Mechler was born in March 1873 at Wisconsin. She was the daughter of William Mechler and Catherine Miller. Anna Rebecca Mechler married William Pluemer, son of Frank Pluemer and Barbary Zeng, on 2 October 1893 at Grant, Wisconsin, also reported as 07 Oct 1893. Anna Rebecca Mechler had 4 with 4 living in 1900 children. 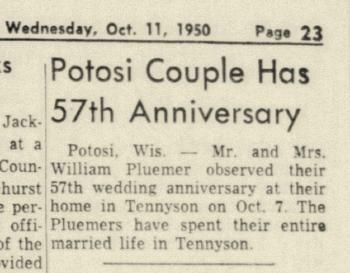 On 7 October 1950 William and Anna (Mechler) Pluemer 57th wedding anniversary celebration. Married Name 26 January 1916 As of 26 January 1916,her married name was Tobin. Bertha Barbara Pluemer was born on 15 February 1894 at Grant, Wisconsin. She was the daughter of William Pluemer and Anna Rebecca Mechler. Bertha Barbara Pluemer married Francis Richard Tobin on 26 January 1916. 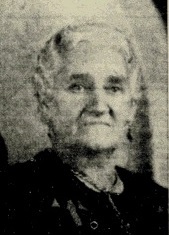 Bertha Barbara Pluemer died on 26 July 1930 at Grant, Wisconsin, at age 36. Married Name before 1925 As of before 1925,her married name was Kahle. Viola C. Pluemer was born in September 1895 at Wisconsin. Viola C. Pluemer married John J. Kahle, son of Theodore Kahle and Louisa Lange, before 1925. Hilda Pluemer was born in March 1898 at Wisconsin. Name Variation Margaret Beatrice Pluemer was also known as Margerit. Married Name 23 September 1922 As of 23 September 1922,her married name was Smith. Margaret Beatrice Pluemer was born on 15 October 1899 at Wisconsin. Margaret Beatrice Pluemer married Ewart Austin Earl Smith on 23 September 1922. Margaret Beatrice Pluemer died on 13 January 2001 at St. Clair, Illinois, at age 101. Alphonse Pluemer was born on 5 July 1902 at Wisconsin. He was the son of William Pluemer and Anna Rebecca Mechler. 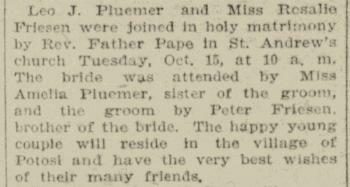 Alphonse Pluemer married Angela J. Meoska, daughter of Theodore Meoska and Katherine Rupp, on 10 September 1925. Alphonse Pluemer died in March 1966 at age 63. Alphonse Pluemer obtained US Social Security Card; last residence Potosi, Grant, Wisconsin; issued through railroad board. Name Variation Mary Pluemer was also known as Marie. Mary Pluemer was born circa January 1905 at Wisconsin. Name Variation Rosalie Friesen was also known as Rose. Married Name 15 October 1907 As of 15 October 1907,her married name was Pluemer. Rosalie Friesen was born before 1889. She married Leo Joseph Pluemer, son of Peter John Pluemer and Sophia M. Kirkenbush, on 15 October 1907 Leo J Pluemer and Rosalie Friesen marriage announcement. Name Variation Oscar Michael Loeffelholz was also known as Michael Oscar. Oscar Michael Loeffelholz married Jolitta B. Pluemer, daughter of Peter John Pluemer and Sophia M. Kirkenbush, at California. Oscar Michael Loeffelholz was born on 29 March 1895 at Paris, Grant, Wisconsin, also reported as 30 Mar 1895. Oscar Michael Loeffelholz died in October 1969 at age 74. Married Name 29 May 1894 As of 29 May 1894,her married name was Loffelholz. Married Name 29 May 1894 As of 29 May 1894,her married name was Loeffelholz. Matilda Kirchberg was born in September 1874 at Wisconsin. Matilda Kirchberg married George Loeffelholz, son of George Adam Loffelholz and Dorothy Wiederhold, on 29 May 1894 at Kieler, Grant, Wisconsin. Matilda Kirchberg died on 3 September 1950. She was buried after 3 September 1950 at Immaculate Conception Catholic Church Cemetery, Kieler, Grant, Wisconsin. Matilda Kirchberg had 9 with 9 living in 1910 children. 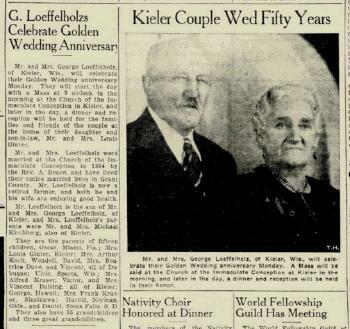 In May 1944 at Wisconsin George and Matilda (Kirchberg) Loffelholz celebrate 50th wedding anniversary. 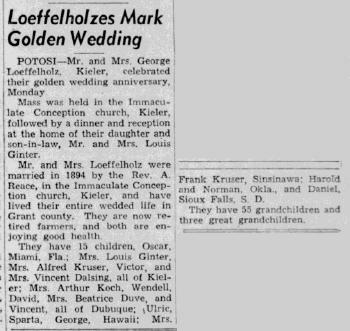 George J. Loffelholz married Agatha Meis. George J. Loffelholz was born circa 1893. He was the son of Henry Loffelholz and Cathrina Kruser. Frank Loffelholz was born circa 1894. Name Variation Helen W. Loffelholz was also known as Ellen. Name Variation Helen W. Loffelholz was also known as W. Ellen. Married Name Her married name was Koch. Helen W. Loffelholz married Arthur Koch. Helen W. Loffelholz was born in December 1898 at Wisconsin. Helen W. Loffelholz died on 15 October 1965 at Wisconsin at age 66. Arthur Koch married Helen W. Loffelholz, daughter of George Loeffelholz and Matilda Kirchberg. Married Name Her married name was Loffelholz. 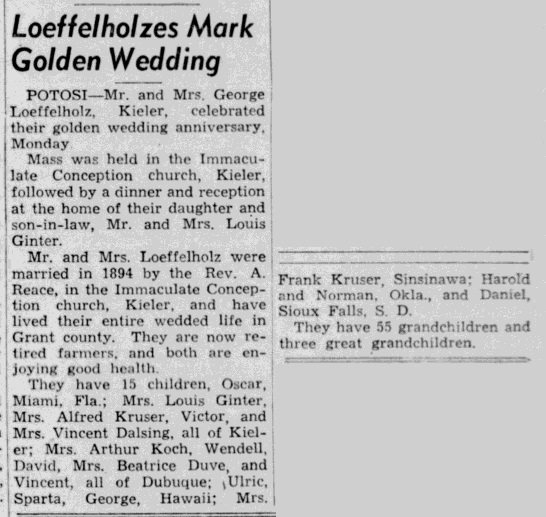 Agatha Meis married George J. Loffelholz, son of Henry Loffelholz and Cathrina Kruser. Helen Loffelholz was born circa 1917. She was the daughter of George J. Loffelholz and Agatha Meis. Louis Loffelholz was born circa 1920. He was the son of George J. Loffelholz and Agatha Meis. Renilda Loffelholz was born circa 1918. Married Name Her married name was Heying. Mary C. Loffelholz married Peter Heying. Mary C. Loffelholz was born circa 1891. She was the daughter of Henry Loffelholz and Cathrina Kruser. Peter Heying married Mary C. Loffelholz, daughter of Henry Loffelholz and Cathrina Kruser. Peter Heying was born circa 1886. Theodore Langen was born in December 1865 at Germany. He was the son of Anton Langen and Helena Bormacher. Theodore Langen married Anna M. Rey, daughter of Gottried Rey and Helena Bannes, circa 1887. Theodore Langen died after April 1930. Name Variation Anna M. Rey was also known as Annie. Married Name circa 1887 As of circa 1887,her married name was Langen. Anna M. Rey was born in February 1867 at Germany also reported as Feb 1864. She was the daughter of Gottried Rey and Helena Bannes. Anna M. Rey married Theodore Langen, son of Anton Langen and Helena Bormacher, circa 1887. Anna M. Rey died after April 1930. Anna M. Rey had 6 with 1 living in 1900 children. She had 11 with 1 living in 1910 children. Anton Langen married Helena Bormacher. Married Name Her married name was Langen. Helena Bormacher married Anton Langen.